The morning after the Auburn vs. Alabama game in 2013, I was watching SportsCenter. It had a pretty amazing montage of the greatest Iron Bowl game ever—and possibly the greatest college football game of all time (sorry Flutie). I went to search for the awesome video I just saw on YouTube and got what I considered a horrific result. SportsCenter had not uploaded it to YouTube yet, but YouTube really messed up and served me this weird foreign video about the Auburn Alabama matchup in 2013. I was pretty surprised YouTube served such a bad video because my intent was very clearly to get a recap of the game. According to Google’s Hummingbird algorithm, my intent should have been considered and it should not have given me such a bad result. After all, Google owns YouTube, so their algorithms have to be fairly similar right? 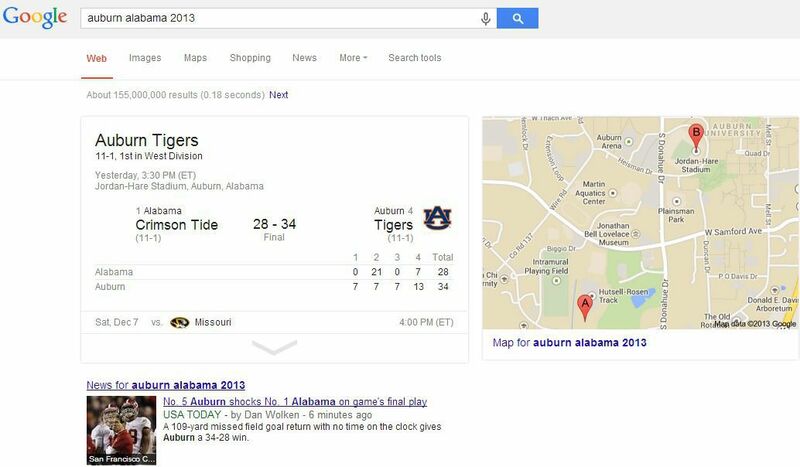 So, I performed the query in Google Search and found much better results with knowledge graph information about Auburn followed by a blog post from ESPN recapping the 2013 Auburn vs. Alabama game. Was there nothing as relevant on YouTube to serve as a result? No, there were actually tons of videos—recaps of the game and people celebrating afterwards. However, the first result was definitely not the best result—in my mind or according to Google. When I performed the same search 2 hours later, I got a MUCH better first result with the best reactions from the 2013 Auburn vs. Alabama game. I believe this ranking adjustment with that video finally overtaking the original video was mostly due to comments, likes and views. YouTube just wasn't as quick at picking up the relevancy of this new video without the engagement to back it up. Is YouTube Slower Than Google Search at Picking up Timely New Content? Search results often fluctuate. However, it seems that YouTube could be suffering from not so fresh data, or an algorithm that is just not sophisticated enough to pick up on timely content. Engagement is definitely important for Google's Search algorithm, but it really focuses on trying to serve the newest relevant piece of content available to give the best answer to a query. It seems that YouTube has to rely much more on engagement than new relevant video content. This is a big conclusion to draw, so I will be doing some more research to see if I can really support that claim. But, based on this extremely small sample size, it appears that Google could be better at picking up fresh, new content than YouTube. Stay tuned for some research on YouTube vs. Google freshness and follow Foster Web Marketing on Facebook to see what else we are talking about.